Xeo Quyt Forest NATURE RESERVE (Xeo Quyt, Xeo Quit; admission 5000d; 7am-5pm) Southeast of Cao Lanh and accessible by boat tour is the beautiful 52-hectare Xeo Quyt Forest (also called Rung Tram) near My Hiep village. One large swamp beneath a beautiful thick canopy of tall trees and vines, it’s one of the final natural jungles left in the Mekong Delta. 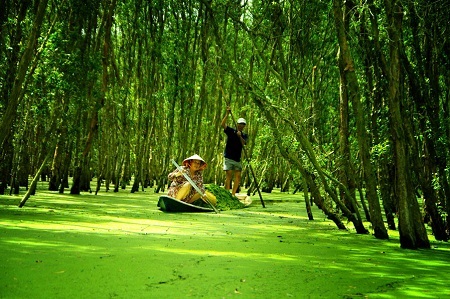 During the humid season a great 20-minute canoe tour (15,000d) takes you past old bunkers and former mine fields along narrow canals filled with ever-present dragonflies and choked with water hyacinths (luc binh). It’s an unique experience but splash on the repellent and try to get out by 4.30pm when the mozzies begin swarming. During the dry season you can discover this area on foot. During the American War the VC had a base here, where top-brass VC lived in under ground bunkers. Only about 10 VC were here at any given time; they were all generals who directed the war from here, just 2km from a US military base. The Americans never knew that the VC generals were living right under their noses. Naturally, they thought about that patch of forest and periodically dropped some bombs on it to reassure themselves, but the VC was still safe in their underground bunkers. From My Hiep, you can hire a boat (around US$20, seating up to 10 people) that takes around 40 minutes to make the 2km journey to Xeo Quyt. Dong Thap Tourist includes a guided trip in a lot of its tour programs. Tram Chim National Park NATURE RESERVE ( 7am-4pm) Tram Chim National Park is due north of Cao Lanh in Tam Nong district and notable for its eastern sarus cranes (Grus antigone sharpii). More than 220 species of bird have been identified within the reserve, but ornithologists will be most interested in these rare red-headed cranes, which grow to an impressive 1.8m high. However, seeing these birds requires a considerable commitment (time, effort and money), so it’s strictly for enthusiasts. Birds nest here from about December to May; from June to November they move to another area like northwest Cambodia, so time your journey to coordinate with the birds’ travel itinerary if you hope to see them. The birds are early risers, so morning visits are recommended. During the day, they’re engaged in the important business of eating. Tam Nong is a sleepy town 45km from Cao Lanh. The one-way drive takes around an hour to travel by car. From Tam Nong it takes another hour by tiny boat (around 2,700,000d) to reach the place where the cranes live and another hour to return. Add to this whatever time you spend (perhaps an hour) bird-watching (bring your own binoculars), this can be a very excellent time, and then the requisite two hours to return to Cao Lanh, it’s up to your type of travel. There are not many rudimentary guesthouses in Tam Nong if you want to stay late or hit the park early. Tam Nong shuts down early so if you want to eat dinner at this place, make arrangements before 5pm.